"Soothing Mexica-themed soup which can be enjoyed as a light meal or with garnishes that can make it more sinful. Freezes well." Heat olive oil in a large pot over medium-high heat and stir in the ground turkey. Cook and stir until the turkey is crumbly, evenly browned, and no longer pink. Transfer turkey to a bowl; set aside. In the same skillet, stir in the onion; cook and stir until the onion is nearly translucent, about 5 minutes. Add the carrots and celery. Continue to cook and stir until tender, about 8 more minutes. Stir in the corn, garlic, taco seasoning, cumin, chili powder, dried oregano, and about 1/4 cup cilantro along with the cooked turkey. Cook and stir until fragrant, about 2 minutes. 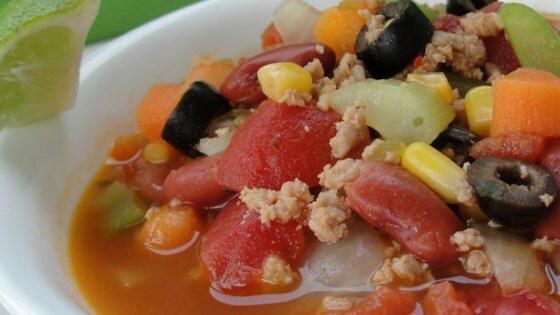 Mix in the tomatoes, kidney beans, green chile pepper, olives, chicken broth, water, and lime juice. Season with salt and black pepper. Bring to a boil, then reduce heat to low and continue to simmer for 20 minutes. Remove chile halves, and garnish with the remaining cilantro before serving. Make this vegetarian by substituting texturized vegetable protein/Quorn®/Boca Burger® crumbles for meat, and use vegetarian broth. Cans of tomato/broth/beans are large so rather than waste parts of the cans, I choose to make a large batch of soup and freeze half of it to enjoy another week. As is the case with all great cooks, please use the chili, salt, pepper, water and lime juice to make the soup as spicy or bland as you desire. Lower the fat content by cooking onions in 2 T chicken broth and 2 teaspoons olive oil, use fat free broth and omit the dairy products. Optional toppings include avocado slices, grated reduced fat Cheddar cheese, tortilla chips, Greek yogurt, and lime wedges. 1st time on website & made this soup. My family loved it. I switched the kidney beans for pinto beans (canned) - this is a recipe for your box. Wow! Wonderful over a bowl of rice with a scoop of greek yogurt as a sour cream substitute.